40" Wagon Wheels, Top Quality Medium Wood Hub. Wagon Wheels, Solid Wood Hub, bronze oil soaked bushing insert is available, and like all of our wagon wheels, it is made with solid steam-bent hardwood construction and hardwood spokes. 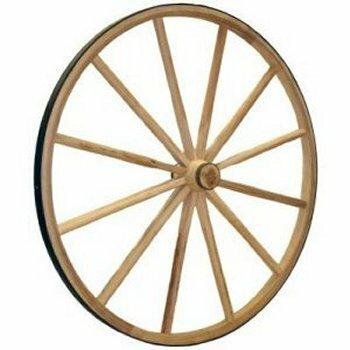 All of our wagon wheels have forge shrunk steel rims, this wheel rim is 3/16". Axles and Custom Wagon Wheels: we can make custom wagon wheels up to 14 feet for most any project, for axles and custom wagon wheel prices please Contact Us . We ship orders as soon as the order is completed, however, please allow 14 days for delivery. If you need faster delivery, please contact us we will try to accommodate your request. This Wheel Is Shipped Via UPS As An Oversized Package And Can Be Expensive, Contact Us For Shipping Discounts On Two Or More Items.